Learn the symptoms of diabetes in dogs and keep your cute Cocker safe! Some signs are easier to spot than others, but at least if you know what you're looking for, you'll be heading in the right direction! If you miss the early symptoms of diabetes in dogs, this disease will continue on its silent but life-threatening journey until the more obvious symptoms of the illness become visible. It's helpful to understand the signs that may suggest your dog has diabetes because it is a serious illness. If this condition isn't untreated it can cause kidney failure, liver and bladder problems, deterioration of his eyesight (including loss of vision) and a susceptibility to bacterial and fungal infections. 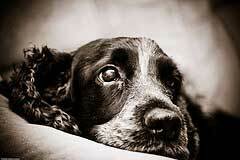 At the very worst, your pet could slip into a coma and death could quickly follow. Now that I've got your attention, I'd just like to re-assure you that having a dog with diabetes is not the end of the world. It is treatable and your dog can go on to have the same quality of life as before, he'll just need a little more TLC! Learn more about dog diabetes here, and then come back here to continue reading to discover the classic symptoms of diabetes in dogs. This is usually one of the first visible symptoms of diabetes in dogs. Increased sugar levels in the blood cause the kidneys to flush the glucose from the body via the urine and (because he's peeing all the time) this can lead to de-hydration. Your dog is constantly thirsty and drinks more and more water, he then needs to pee again...and so it goes on! If your Spaniel is left alone during the day and you come home to unexpected 'little puddles' on the floor...that just might be your first clue! With diabetes, no matter how much your pet eats, he'll never be satisfied; he'll always feel hungry. This is because the essential nutrients from his food, such as glucose, aren't being absorbed and utilized properly because of the lack of insulin; his body is being robbed of nutrition. The brain also needs a small amount of insulin to control appetite and weight gain; it gives the body a sense of 'feeling satisfied' after eating. When insulin levels are low, that won't happen; your dog will continue to eat more because he'll still feel hungry. Despite his increased appetite, your dog will almost certainly lose weight. This is because, when diabetic, the pancreas stops producing the insulin that the cells need in order to convert glucose into energy. When the body doesn't have the energy it needs, it begins to use the body's store of fats and protein for energy instead. And this is what causes your dog to lose weight, even though he's eating more. Glucose is what gives your dog his energy; it's the main fuel for all the cells in his body. But because his little body is no longer capable of converting the glucose into the energy he needs, he begins to feel lethargic, disinterested, depressed; and he'll probably do a lot of sleeping. Of all the symptoms of diabetes in dogs, this is probably the most serious because when blood glucose levels rise, ketone levels increase. Ketones (often misspelled as keytones) are a type of acid that's produced when your pet's body can't get the energy it needs from carbohydrates (because the insulin isn't doing its job) and begins to burn fat reserves instead. High levels of ketones are toxic and can make your diabetic dog very sick. He'll lose his appetite for food and water, he may vomit, and if he's not treated quickly, he could lapse into a coma. Diabetes can cause cataracts to form in your dog's eyes which, long term, can affect his vision and can lead to eventual blindness. The good news is that cataracts can be successfully treated with surgery. An early indication of cataracts is where the eyes begin to look milky or cloudy. If you'd like to learn more about cataracts, follow the link. 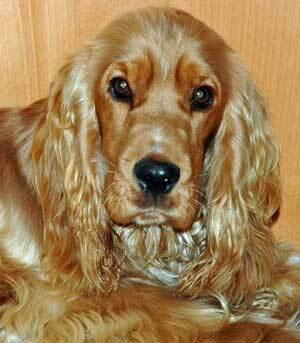 Increased sugar levels can also make your Spaniel more prone to infections. That's because high levels of glucose in the urine often lead to bacterial growth in the bladder which can cause kidney and urinary tract infections. Diabetes also makes our pets more susceptible to infections of the mouth and gums. As with many illnesses and diseases your dog's skin and coat may suffer as a result. His coat may lose its beautiful shine and become lack-luster, thin, and may begin to fall out in patches or clumps. The condition of his skin may deteriorate, becoming dry, flaky, and itchy and it may take longer for sores, wounds, scratches or abrasions to heal. Without insulin to help with the process of converting glucose into energy, the body's cells begin to shut down, leading to organ damage, including the kidneys, liver, and the eyes. Although there isn't any cure for dog diabetes, it can easily be brought under control, especially if it's diagnosed early. It's especially important therefore to be alert for the early signs, (change in eating habits, drinking more water, etc). The minute you notice any of these early signs, please take your Cocker Spaniel to see his vet. However, if you miss those early symptoms (and it's easy to do) and your dog is clearly ill, has stopped eating, or is vomiting, he's in serious trouble and will probably need to be hospitalized, quickly. If you find yourself at this point, don't delay, the sooner your pet is diagnosed, the sooner he can be treated to help bring him back to his normal happy healthy self! If you'd like to learn more about diabetes, or managing diabetes in dogs, simply follow the link.